Shown seated (from left) are: Deborra-Lee Jackman, Anna Wintour, Wendi Deng Murdoch, and Gayle King. Shown standing, (from left) are: Irving Milgrom, Cheryl Scharf, Hugh Jackman, Dan Faber, David Scharf, Jeff Harrison, Vera Wang, Xin Li, Dana Garner and Chris Garner. Flushing, NY David Scharf, litigation partner and chair of the real estate restructuring and finance practice at Morrison Cohen LLP, and USTA Foundation board member, joined celebrities who turned out in force to show their support at the USTA Foundation Gala, which marked the opening night of the 2018 US Open. Co-hosted by Billie Jean King and TV personality Michael Greenberg, the event at Arthur Ashe Stadium raised $1.5 million for tennis and education. A VIP auction featuring admission to any concert anywhere in the U.S. by country singer Luke Bryan raised an additional $55,000. The foundation also presented Pam Shriver, former pro tennis player, with a surprise award for leadership and advocacy. The USTA Foundation, the charitable arm of the United States Tennis Association, brings tennis and education together to change lives, serving more than 225,000 young people. To date, the foundation has awarded more than $25 million in grants and scholarships benefiting thousands of children and adults through tennis, education and health curricula. 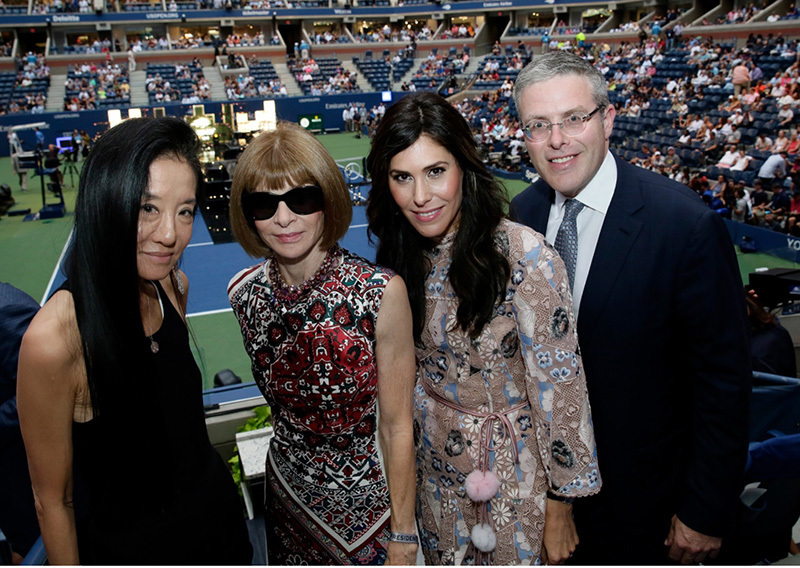 Shown (from left) are: Vera Wang, Anna Wintour, Cheryl Scharf, and David Scharf.